This is part of a series about how to catch snakes in various places: Trees, land, and water. The first thing of course, is that you know the species of snake you’re trying to catch. Monocled cobras are known to hang out in bushes, and even banana trees. You wouldn’t want to grab hold of a monocled cobra’s tail unless you have a lot of experience handling them. I probably wouldn’t try to grab it myself – unless I could see the entire body – and that means the head too. Monocled cobras need not ‘hood up’ in order to bite, they can bite anytime. A mangrove cat snake in a tree near some ponds. Can you see it? Most snakes you’ll be catching in the trees are ‘tree snakes.’ Thailand has a number of snakes that spend a significant amount of time in the trees. Here are some of them. 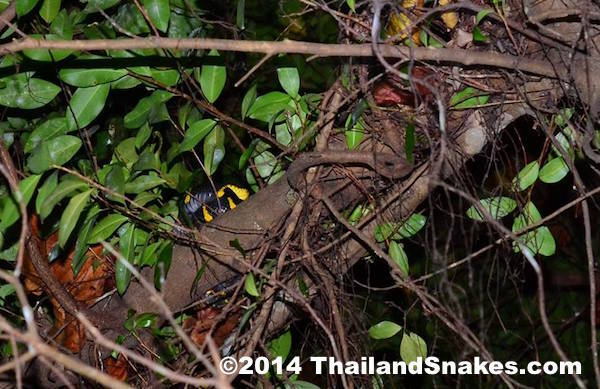 King Cobra (O. hannah) – though primarily ground dwelling, they are often found in the trees. Monocled Cobras (N. kaouthia) – not often, but they can be found in bushes and small trees. Ensure you know what the species of snake is, before you try to catch it. This is essential in Thailand because we have so many snakes that can kill you (37). If you don’t know what species of snake it is – don’t catch it. Simple as that. If you don’t know what you’re dealing with, how could you possibly be prepared for what the snake might do? Use snake tongs for best chance at grabbing the snake. Learn how to use tongs so you don’t harm the snake. There’s never a reason to clamp down and squeeze the snake hard. If you’re doing that, you shouldn’t ever be using tongs. Tongs are rib breakers in the hands of someone who doesn’t know what they’re doing. We’re going to have a video course about using tongs shortly. If you’re 100% sure the snake is non-venomous, you can wrap your hand in a snake bag and grab the tail gently. You should have a long sleeved shirt on, which will help soften the bite for the snake, so it doesn’t lose teeth during the bite. This is a crucial consideration that many people don’t take into account. Some snake enthusiasts think, because the bite doesn’t hurt much, they can just let the snake bite as much as it wants. Thing is, it’s detrimental to the snake – and it may be losing teeth as it bites. Not ideal. The snake needs its teeth! Few snakes respond well to a hand (or anything) coming straight at their head. Always come from behind if possible, and underneath. As you support the snake with your hand and arms, the snake will think it’s a branch, or something else harmless. We’ll have a snake handling video in a few weeks here too. If you’re bagging the snake, sometimes the best opportunity you’ll get is when first contacting it in the tree – especially if sleeping at night. Have a bag ready. Find a stick long enough to be 1 meter longer than the height needed to reach the snake. Keep some of the small branches at the very end of it so the snake will have somewhere to climb onto. Avoid climbing a tree if possible, because the snake may notice you and climb higher – eliminating all chances of bagging it. Shake the tree, or a vine that is touching the branch the snake is on. Keep the stick still and next to the snake so it can see this stick is still and solid – while all other branches are moving around it. It will likely move toward the still stick. If you cannot shake the tree or a vine, have two sticks – the same length – to reach the snake. One stick pushes the branch the snake is on, and one stick is steady next to the snake, so it comes over onto it. If you cannot get a stick up through the branches, or if the snake is just too high, you might try to climb the tree and reach the snake with tongs. Hooks are not very good for snakes in trees because the hook gets caught on branches, and it doesn’t provide a good resting place for a snake – which can easily slip off. That’s how we go about getting snakes down from trees, if we need to. We don’t always need to.